NASA SPACE SHUTTLE DISCOVERY NATIONAL AERONAUTICS AND SPACE ADMINISTRATION HISTORY | RETURN TO EARTH. NASA's vision is "to improve life here, extend life to there, and to find life beyond." Its mission is "to understand and protect our home planet; to explore the Universe and search for life; and to inspire the next generation of explorers." Following the Soviet space program's launch of the world's first man-made satellite (Sputnik 1) on October 4, 1957, the attention of the United States turned toward its own fledgling space efforts. The U.S. Congress, alarmed by the perceived threat to American security and technological leadership, urged immediate and swift action; President Dwight D. Eisenhower and his advisers counseled more deliberate measures. Several months of debate produced agreement that a new federal agency was needed to conduct all nonmilitary activity in space. On July 29, 1958, President Eisenhower signed the National Aeronautics and Space Act of 1958 establishing the National Aeronautics and Space Administration (NASA). When it began operations on October 1, 1958, NASA consisted mainly of the four laboratories and some 8,000 employees of the government's 46-year-old research agency for aeronautics, the National Advisory Committee for Aeronautics (NACA). NASA's early programs were research into human spaceflight, and were conducted under the pressure of the competition between the USA and the USSR (the Space Race) that existed during the Cold War. The Mercury program, initiated in 1958, started NASA down the path of human space exploration with missions designed to discover simply if man could survive in space. On May 5, 1961, astronaut Alan B. Shepard Jr. became the first American in space when he piloted Freedom 7 on a 15-minute suborbital flight. John Glenn became the first American to orbit the Earth on February 20, 1962 during the 5-hour flight of Friendship 7. Once Mercury proved that human spaceflight was possible, project Gemini was launched to conduct experiments and work out issues relating to a moon mission. The first Gemini flight with astronauts on board, Gemini III, was flown by Virgil "Gus" Grissom and John W. Young on March 23, 1965. Nine other missions followed, showing that long-duration human space flight was possible, proving that rendezvous and docking with another vehicle in space was possible, and gathering medical data on the effects of weightlessness on humans. Following the success of the Mercury and Gemini programs, the Apollo program was launched to try to do interesting work in space and possibly put men around (but not on) the Moon. The direction of the Apollo program was radically altered following President John F. Kennedy's announcement on May 25, 1961 that the United States should commit itself to "landing a man on the Moon and returning him safely to the Earth" by 1970. Thus Apollo became a program to land men on the Moon. The Gemini program was started shortly thereafter to provide an interim spacecraft to prove techniques needed for the now much more complicated Apollo missions. After eight years of preliminary missions, including NASA's first loss of astronauts with the Apollo 1 launch pad fire, the Apollo program achieved its goals with Apollo 11 which landed Neil Armstrong and Buzz Aldrin on the moon's surface on July 20, 1969 and returned them to Earth safely on July 24. Armstrong's first words upon stepping out of the Eagle lander captured the momentousness of the occasion: "That's one small step for [a] man, one giant leap for mankind." Twelve men would set foot on the Moon by the end of the Apollo program in December 1972. NASA had won the space race, and in some senses this left it without direction, or at the very least without the public attention and interest that was necessary to guarantee large budgets from Congress. After Lyndon Johnson left office, NASA lost its main political supporter, and Wernher von Braun was moved to a position lobbying in Washington. Plans for ambitious follow-on projects to construct a space station, establish a lunar base and launch a human mission to Mars by 1990 were proposed but with the end to procurement of Saturn and Apollo hardware there was no capability to support these. The near-disaster of Apollo 13, where an oxygen explosion nearly doomed all three astronauts, helped to recapture attention and concern, but although missions up to Apollo 20 were planned, Apollo 17 was the last mission to fly under the Apollo banner. The program ended because of budget cuts (in part due to the Vietnam War) and the desire to develop a reusable space vehicle. Although the vast majority of NASA's budget has been spent on human spaceflight, there have been many robotic missions instigated by the space agency. In 1962 the Mariner 2 mission was launched and became the first spacecraft to make a flyby of another planet – in this case Venus. The Ranger, Surveyor, and Lunar Orbiter missions were essential to assessing lunar conditions before attempting Apollo landings with humans on board. Later, the two Viking probes landed on the surface of Mars and sent color images back to Earth, but perhaps more impressive were the Pioneer and particularly Voyager missions that visited Jupiter, Saturn, Uranus and Neptune and sent back science and color images from all. Having lost the space race, the Soviet Union had, along with the USA, changed its approach. On July 17, 1975 an Apollo craft (finding a new use after the cancellation of Apollo 18) was docked to the Soviet Soyuz 19 spacecraft. Although the Cold War would last many more years, this was a critical point in NASA's history and much of the international co-operation in space exploration that exists today has its genesis here. America's first space station, Skylab, occupied NASA from the end of Apollo until the late 1970s. The space shuttle became the major focus of NASA in the late 1970s and the 1980s. Planned to be a frequently launchable and mostly reusable vehicle, four space shuttles were built by 1985. The first to launch, Columbia did so on April 12, 1981. The shuttle was not all good news for NASA – flights were much more expensive than initially projected, and even after the 1986 Challenger disaster highlighted the risks of space flight, the public again lost interest as missions appeared to become mundane. Nonetheless, the shuttle has been used to launch milestone projects like the Hubble Space Telescope (HST). The HST was created with a relatively small budget of $2 billion but has continued operation since 1990 and has delighted both scientists and the public. Some of the images it has returned have become near-legendary, such as the groundbreaking Hubble Deep Field images. The HST is a joint project between ESA and NASA, and its success has paved the way for greater collaboration between the agencies. In 1995 Russian-American interaction would again be achieved as the Shuttle-Mir missions began, and once more a Russian craft (this time a full-fledged space station) docked with an American vehicle. This cooperation continues to the present day, with Russia and America the two biggest partners in the largest space station ever built – the International Space Station (ISS). The strength of their cooperation on this project was even more evident when NASA began relying on Russian launch vehicles to service the ISS following the 2003 Columbia disaster, which grounded the shuttle fleet for well over two years. Costing over one hundred billion dollars, it has been difficult at times for NASA to justify the ISS. The population at large have historically been hard to impress with details of scientific experiments in space, preferring news of grand projects to exotic locations. Even now, the ISS cannot accommodate as many scientists as planned. During much of the 1990s, NASA was faced with shrinking annual budgets due to Congressional belt-tightening in Washington, DC. In response, NASA's ninth administrator, Daniel S. Goldin, pioneered the "faster, better, cheaper" approach that enabled NASA to cut costs while still delivering a wide variety of aerospace programs (Discovery Program). That method was criticized and re-evaluated following the twin losses of Mars Climate Orbiter and Mars Polar Lander in 1999. Welcome to NASA's Return to Flight Web coverage. Here's where you'll find everything on Discovery's mission, NASA's next step into the future. Five of the seven Return to Flight crew members spoke to reporters during a press conference from Edwards Air Force Base in California. Commander Eileen Collins opened the briefing speaking of the team's excitement to come home. "It's absolutely fantastic being back here on planet Earth," said Collins. Later, Collins elaborated on the spectacular view from space. "We saw some of the most beautiful parts of the Earth," said Collins. "At night we saw Southern Lights -- in fact we flew through the aurora!" Pilot Jim Kelly remarked on the confidence he had in the entire Space Shuttle team. "In this job we are the tip of a pyramid of thousands and thousands of people and you can't sit at the top without trusting them." After Kelly spoke, Mission Specialist Soichi Noguchi from the Japanese Space Agency expressed his happiness and satisfaction with the flight. 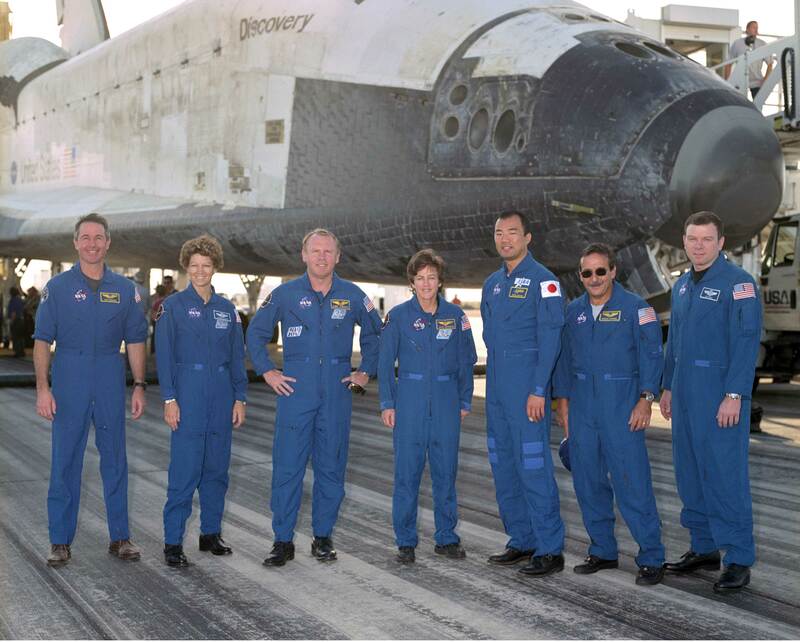 "It has been a great honor to participate in this mission and with this crew," said Noguchi. "I feel like going back to the station tomorrow." Discovery launched on July 26 and spent almost 14 days on orbit. + Transcript: July 31 "Meet the Press"
The STS-114 crew gathers with Commander Eileen Collins as she describes the success of the mission. The crew of Discovery makes their way onto the tarmac after a 5.8 million mile mission around the Earth. Discovery makes a picture-perfect landing at Edwards Air Force Base, Calif. Probably the most publicly-inspiring mission of recent years has been the Mars Pathfinder mission of 1997. Newspapers around the world carried images of the lander dispatching its own rover, Sojourner, to explore the surface of Mars in a way never done before at any extra-terrestrial location. Less publicly acclaimed but performing science from 1997 to date (2004) has been the Mars Global Surveyor orbiter. Since 2001, the orbiting Mars Odyssey has been searching for evidence of past or present water and volcanic activity on the red planet. On January 14, 2004, ten days after the landing of Mars Exploration Rover Spirit, President George W. Bush announced the Vision for Space Exploration. Humankind will return to the moon by 2020, and set up outposts as a testbed and potential resource for future missions. The space shuttle will be retired in 2010 and the Crew Exploration Vehicle will replace it by 2014, capable of both docking with the ISS and leaving the Earth's orbit. The future of the ISS is somewhat uncertain – construction will be completed, but beyond that is less clear. The Centennial Challenges, technology prizes for non-government teams, were established in 2004. Some commentators such as Mark Wade note that NASA has suffered from a 'stop-start' approach to its human spaceflight programs. The Apollo spacecraft and Saturn family of launch vehicles were abandoned in 1970 after billions of dollars had been spent on their development. In 2004 the U.S. Government proposed eventually replacing the Shuttle with a Crew Exploration Vehicle that would allow the agency to again send astronauts to the Moon. Despite the reduction of its budget following project Apollo, NASA has maintained a top-heavy bureaucracy resulting in inflated costs and compromised hardware.